Sept. 20th workshop in Highland Park, NJ! The workshop is open to all genders. No prior singing or dance experience is needed. As we turn our awareness to the ever present silence of the Heart, the essence of who we are starts to shine. When we do this collectively we remember that the open, spacious heart we find inside is also inside of everyone and everything. Kathleen guides us to a deep listening with our ears, our bodies, and our hearts; out of that listening arises connected and joyful community song and dance that is both remembrance and expression of the truth that we are One Heart. 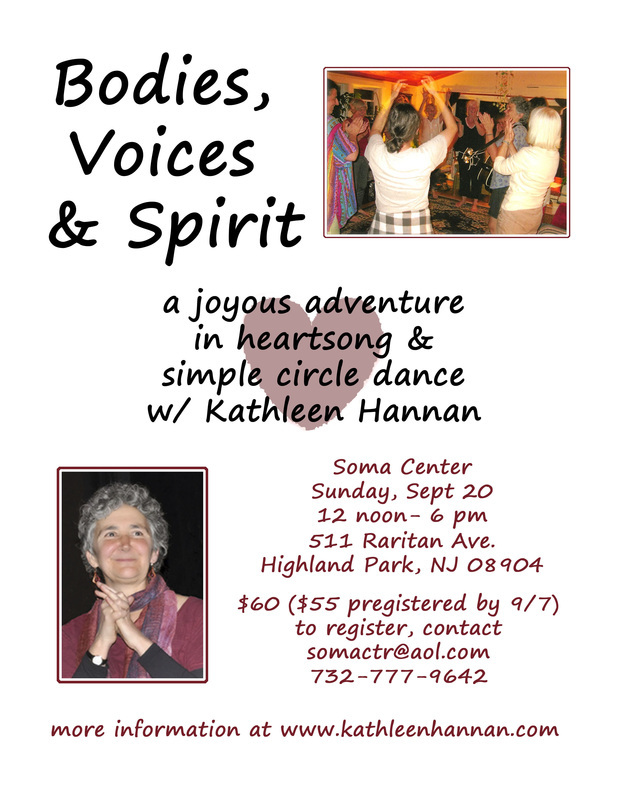 Some of the songs we’ll sing are from the world’s spiritual traditions, some are based in poetry of mystics from earlier centuries, and some are Kathleen’s original compositions, rooted in her own experience as a student of the Heart. The circle dances are relaxing and invigorating for the body, opening us to a sense of space, support, flow and ease of movement. We’ll also do a lying down meditation, so please bring a pillow, yoga mat, blanket; whatever you’d like to make yourself comfortable. Light snacks and juice will be provided; feel free to bring other snacks if you like. Participants will receive an email after the workshop that includes lyrics to all the songs as well as links to audio or youtube links of some of the songs. You are welcome to bring a digital recorder if you want to record the songs. Questions about the content of the workshop? Please drop Kathleen a note here. To register for the workshop please contact somactr@aol.com 732-777-9642.